Ah, what a luxurious way to do a trail! A zero in each town, ha! Seriously, we only had two zeros planned for this trip, but both our warm-up hike and this past leg, we’ve finished early enough (and weather has been intimidating enough) to push on to town a night early and then get a full zero the next day. We are on a fixed schedule with permitted sites up ahead in national parks, so we needed to make a conservative itinerary to buffer for difficult sections, injuries, or weather. Since none of those have appeared just yet (they will! ), we get a zero. We’ll take it! I may just have to adopt this way of hiking! 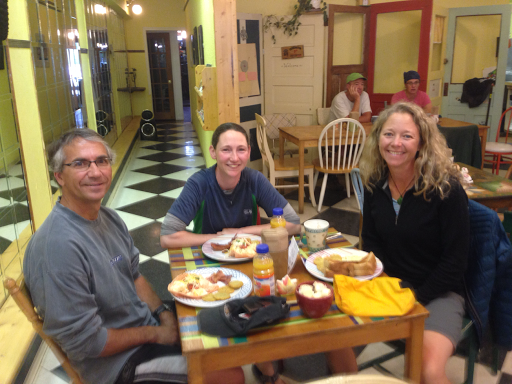 We had a morning date with a Canadian hiking friend that we both met and overlapped with on the CDT in 2013…Mtn Rat! Mtn Rat lives in Fernie, just 45mins away and we got to hang out, yay! Breakfast at the Stone’s Throw in Blairmore is a great spot. Still in my hiker hunger mode, I ate two breakfasts. Just shocking to me since I don’t eat much breakfast off trail. Breakfast at Stone’s throw in Blairemore with Mtn Rat! I mentioned yesterday that somehow the side blew out of my right shoe and it totally angles on my bad ankle and should not be hiked on. I needed to get new shoes. None of the stores in Coleman or Blairmore were open this Sunday, so we drove another 40mins to the bigger town of Pincher Creek. THANK YOU to Mtn Rat for making this happen! It would have been quite a challenge to do all this without him! I have a heck of a time finding shoes for my wide hobbit feet and immediately saw a pair of Solomons that called to me since I knew they sold wide shoes. They are the Solomon XR Crossmax 1.0 and they will hopefully get me at least the next 200mi or so to my next pair of shoes. If I’m lucky, they may take the place of the Montrail Masochists after the GDT. 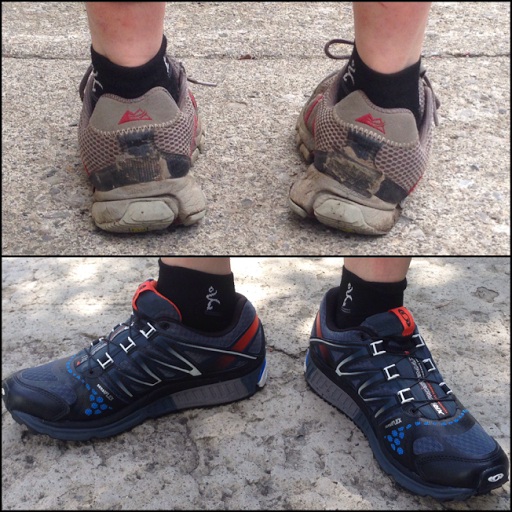 I just have not loved those shoes, but they were the best of what I could find. We shall see, but at least I have something! We returned to Coleman where we had a reservation for the very hiker friendly Safe Haven. Word has spread and all GDT hikers know this is the place to go when coming through Coleman. It is a quaint place run by Alannah and Dan who love hikers and give a discount to those doing the GDT. We had much of the day to relax and do our town chores. It was glorious! E reading up on our next section while snacking on Cheetos. Now she’ll have to bear hang her pages! We did our resupplies and find it quite amusing how opposite our food choices are. Notice also that E’s hiker hunger hasn’t hit since she just started hiking. As if you need to know, the dividing line here is where the Oreos and Cosmic Brownies lie. 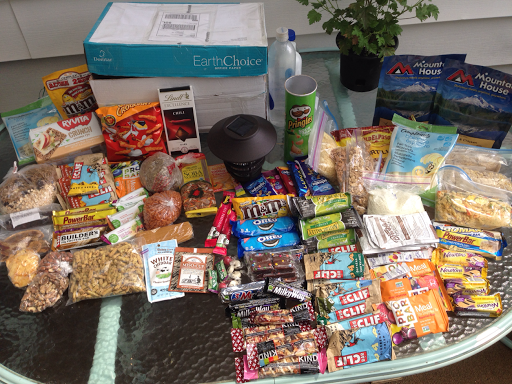 Here is a list of what we each carry…E: Power Bars, Clif Bars, ProBars, Panda Licorice, Simple Truth Kale Bars, Protein Enriched (lentil & chickpea) pasta, wild rice sticks, dried fruits/nuts, carrot & squash macaroni, curry lentil soup mix, bfast blend(all bran, currants, sunflower seeds, oats), Ryvita crackers, string cheese, M&Ms, hard candy, chili dark chocolate, lipton powdered tea, Emergen-C, Soba noodles, Gluten free cheese powder, and Cheetos. Wired: Pringles, Mountain House Dinners, soft tortillas, string cheese, tuna/salmon, Power Bars, Candy Bars, Oreos, Nature Valley Bars, ProBars, Clif Bars, Kind Bars, Odwalla Bars, Luna Bars, powdered milk, Carnation Instant Bfast powder, Fig Newtons, Little Debbie Cosmic Brownies. E (left), Wired (right) resupplies for 6 nights/7 days. While here, Alannah wants to do all she can to help with what hikers need. 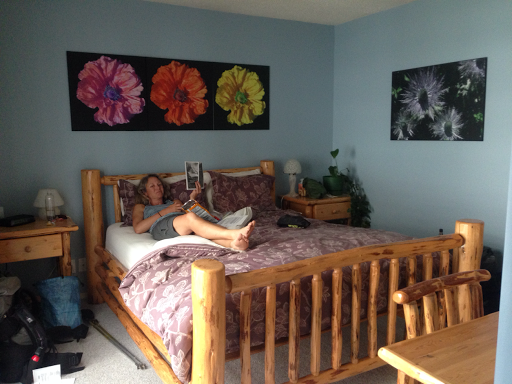 She and Dan believe that if you walked here from Waterton, you deserve more than the average guest. She enjoys making breakfast and dinner(for hikers! ), taking you to run errands, having a computer for use, a family room and outdoor space for lounging, etc. 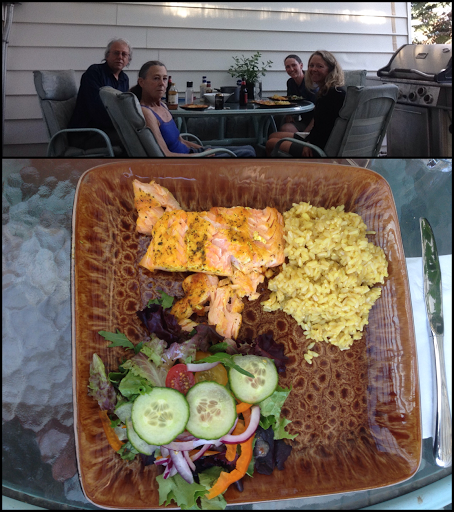 We had a wonderful dinner of salmon, rice, and salad tonight. Dinner with Dan and Alannah. Whew, lots happened and zeros always go by so fast. One random note I mentioned briefly a couple days ago. My camera is not working, ugh! I’m just not very kind to them I guess. I plan to have a new one next town or the next one after that, but this last few posts and this coming leg will be iPhone photos, which aren’t coming out too bad on the blog…I just want to have better quality for post trail presentations and such. Now I have an hour or two of email and blog stuff and I hope to watch at least one episode of Orange Is the New Black before bed!